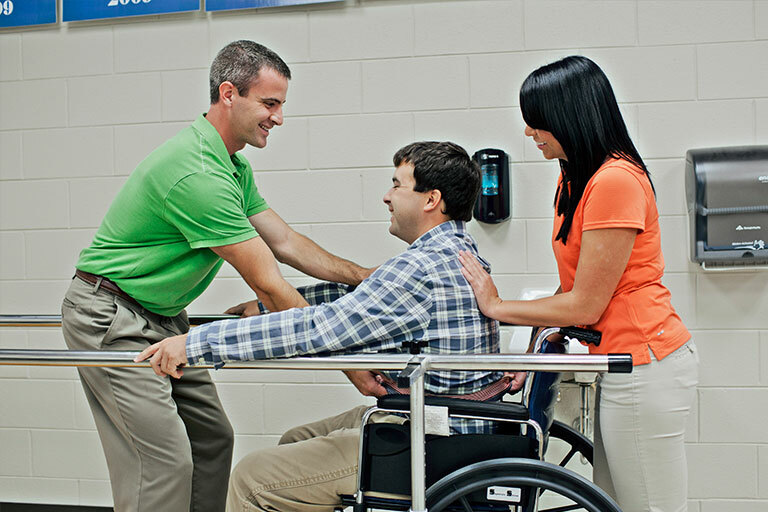 This two-year program prepares the student to become a skilled assistant working under the supervision of a physical therapist to provide patient services that alleviate physical impairments and restore function. The program utilizes a selective admissions process with limited enrollment. Admission to the college does not guarantee acceptance into the program. New students are admitted once yearly with PTA courses beginning in the Fall Semester. The Associate in Applied Science Degree is comprised of 26-30 hours of general education course work and 38 hours of program-specific technical course work, including three clinical experiences at various clinical sites. Students are prepared to take the certification examination. Demand for physical therapy services is expected to increase in response to the healthcare needs of an older population and growing rates of chronic conditions such as diabetes and obesity. SCC’s PTA Program is located on the Somerset Campus north, in Somerset, Kentucky, with classroom, laboratory and faculty offices located on the second floor of the Harold Rogers Student Commons building. Students enrolled in the program are expected to attend all program courses in person unless otherwise specified in course syllabi. General education courses may be completed at any KCTCS institution or may be transferred from other accredited institutions. Prospective students with transfer credits should submit a transcript to the Office of the Registrar to determine the transferability of those course credits prior to application to the program. The Physical Therapist Assistant Program at Somerset Community College is committed to academic excellence for students seeking associate degrees in the discipline. Program graduates will be prepared to act as contributing members of an inter-professional team and to interact with all constituents in a culturally sensitive manner. They will be knowledgeable of theories and principles supportive of skills and procedures critical to the physical therapist assistant. Graduates, as they enter the workforce, will have achieved competency with general techniques common to practice settings available to them in the physical therapy communities served by Somerset Community College. They will be prepared to meet standards to obtain state credentials as a physical therapist assistant and to function in a technically competent, caring, responsible and safe manner under the supervision of a physical therapist. The Physical Therapist Assistant Program at Somerset Community College is accredited by the Commission on Accreditation in Physical Therapy Education (CAPTE), 1111 North Fairfax Street, Alexandria, Virginia 22314; telephone: 703-706-3245; email: accreditation@apta.org; website: http://www.capteonline.org. If needing to contact the program/institution directly, please call 606-451-6823 or e-mail ron.meade@kctcs.edu. The SCC Program engages in continuous and systematic evaluation and improvement. Comments, suggestions, ideas, and constructive criticism are welcomed as a part of the program’s assessment process. SCC’s due process policies, as outlined in the KCTCS Catalog and related handbooks, provide a voice to current and prospective students, employees and other affiliated persons. However, individuals in the community who do not have a formal affiliation with SCC or SCC’s PTA Program, including clinical education sites, employers, and members of the general public, are also welcome to provide comments according to the following policy. This process pertains only to comments or concerns that cannot be addressed by existing grievance / due process procedures described in the KCTCS catalog, personnel handbook, student code of conduct, or PTA Program Policy and Procedure Manual or Student Handbook. Comments must be provided in writing and signed by the author. Anonymous submissions will not be acknowledged; nor will written comments provided on behalf of an anonymous source. Comments must be submitted to the Program Director at the following address. The PTA Program Director shall respond to all comments within ten (10) business days of receiving the complaint in an attempt to resolve the issue. If satisfactory resolution is not or cannot be reached, appeal may be made to the Health Division Chairperson and Dean of Academic Affairs, in that order. Again, if satisfactory resolution is not or cannot be reached, appeal may be made to the Office of the President. The decision of the President is final and not subject to further appeal. Neither the Dean nor the President will become involved until all attempts to resolve the issue through the Program Director have been exhausted, unless the comment is directly related to the performance of the Program Director. The PTA Program, including its faculty, committees and others associated with the program, will not retaliate following the complaint with regards to admission, grading, use of clinical sites or clinical placements, graduation or any other manner that may unfairly and adversely impact the complainant. This extends not only to program students, but also to graduates, clinical educators and employers, members of the general public, and others.